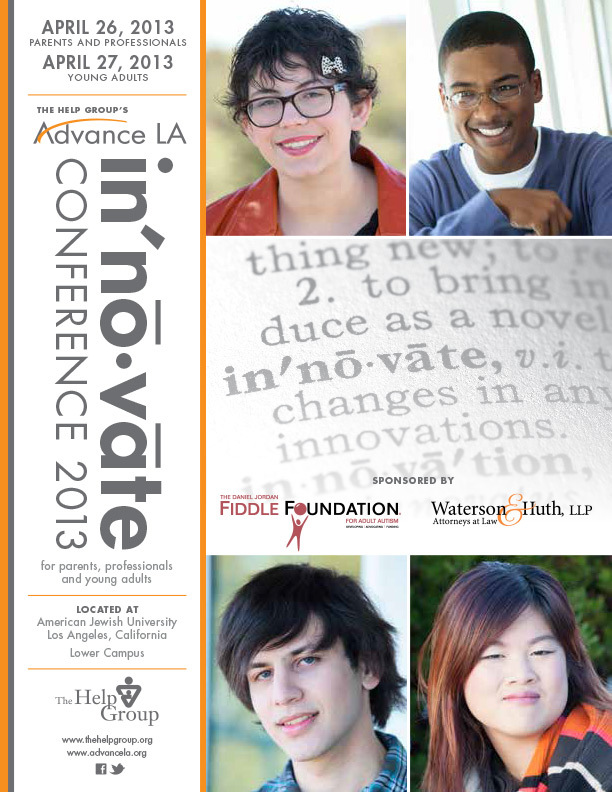 In 2013, Advance LA hosted the Innovate Conference for parents, professionals, and young adults to collaborate and explore ways to successfully navigate the transition process. The conference, held at American Jewish University, was on Friday, April 26 for parents and professionals and Saturday, April 27 for teens and young adults. As young adults with autism spectrum disorder, learning disabilities, Asperger’s Disorder, executive functioning challenges, and other social or emotional issues prepare to transition to college, the workforce, and beyond, they often experience a lack of resources and guidance to help them along the way. Advance LA is a program of The Help Group that specializes in preparing these young people for a successful future. Day one of the conference brought together a community of professionals and parents to explore innovative and viable strategies to ease the transition between high school and the next step. Notable conference presenters for day one included Keynote Address speaker Erik Carter, PhD, Associate Professor of Special Education at Vanderbilt University; David Finch, author of The New York Times Best Seller, The Journal of Best Practices: A Memoir of Marriage, Asperger’s Syndrome, and One Man’s Quest to be a Better Husband; and Richard Guare, PhD, BCBA, with Colin Guare, coauthors of Smart but Scattered Teens: The “Executive Skills” Program for Helping Teens Reach Their Potential. Day two, the first conference of its kind designed specifically for teens and young adults, featured a number of hands-on interactive workshops that provided attendees with the opportunity to learn new skills and interact with peers. Workshops were conducted on topics such as searching for a job, exploring creative arts, managing stress, healthy living, college exploration and success, and building relationships with others.